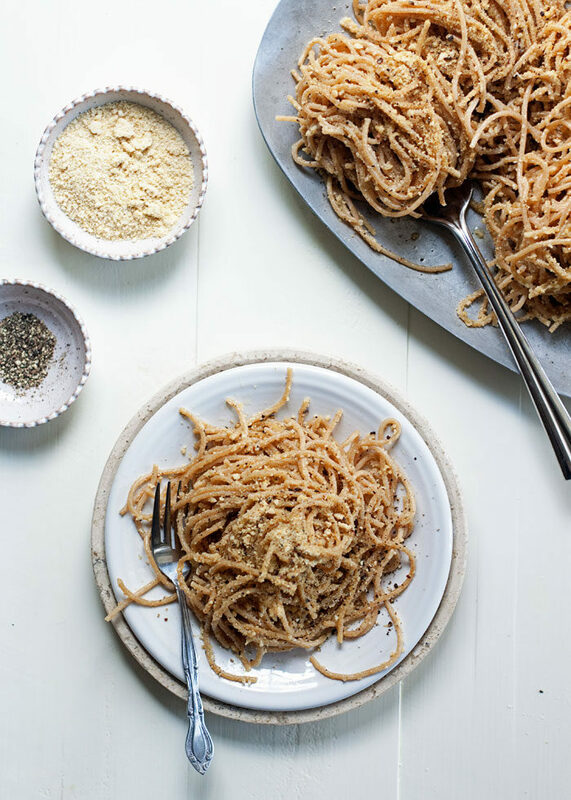 With cashew parmesan in place of the pecorino romano, this vegan version of the cheese-and-black-pepper pasta staple comes remarkably close to the real thing. Only 8 ingredients (including olive oil, salt, and pepper) and done in 20 minutes! 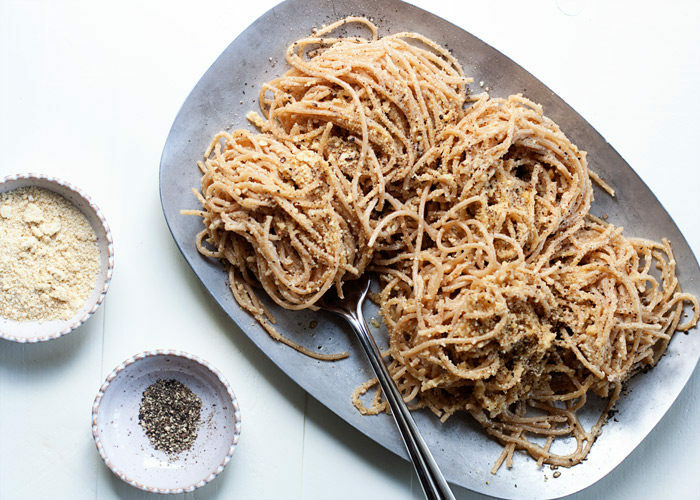 Cacio e Pepe – “cheese and pepper,” literally translated – is kind of a Stonehenge of recipes. In that it’s sacred. Revered. Hallowed. Meant to be untouched. 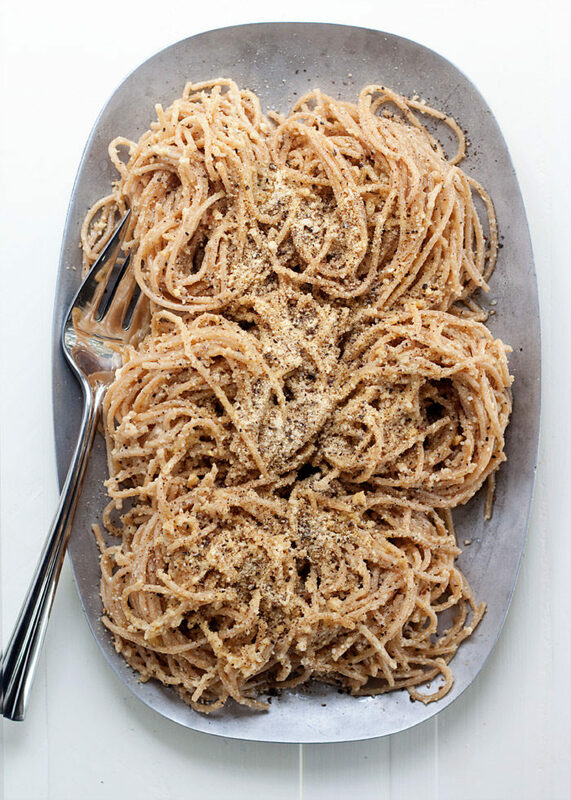 Today I’m revealing my inner rebel and not only seriously messing with the recipe, but I’m also calling it Vegan Cacio e Pepe. I know, I know … besides the fact that it’s sacred, there’s also this: If Cacio e Pepe doesn’t have cheese in it, it’s not really Cacio e Pepe. But here’s the deal. 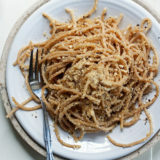 I used to love me some Cacio e Pepe (and its variations). Something fierce. Then I went all dairy free and whatnot, and here I am, wanting Cacio e Pepe and not being able to have it. Bad things, good people. So I thought I’d try something that just might satisfy my craving. I thought, what if I tossed a whole slew of cashew parm into some pasta and cracked a bunch of black pepper over the top? Would it satisfy my lust for Cacio e Pepe?! The first time I took a bite, my eyes went wide. Good wide. “DAMN, that’s AWESOME” wide. Seriously, this stuff is so, so delicious and tastes shockingly close to the authentic stuff. But without a speck of cheese! For real! I think it’s worthy of being called the real thing (well, preceded by the word “vegan,” of course) even if it really isn’t. Lord knows I’m more than happy sticking with this version and never going back to the original. 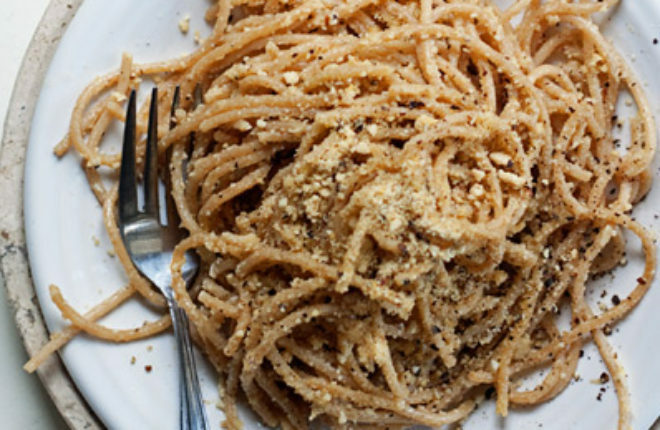 If you’ve tried cashew parmesan, you already know it’s kind of magical stuff. Basically, you grind cashews with nutritional yeast, salt, and a little garlic powder if you like. The taste comes seriously close to the real thing, and it’s incredible on everything. Soup. Pizza. And oh mylanta, popcorn. And mixed straight in with pasta and black pepper, too. 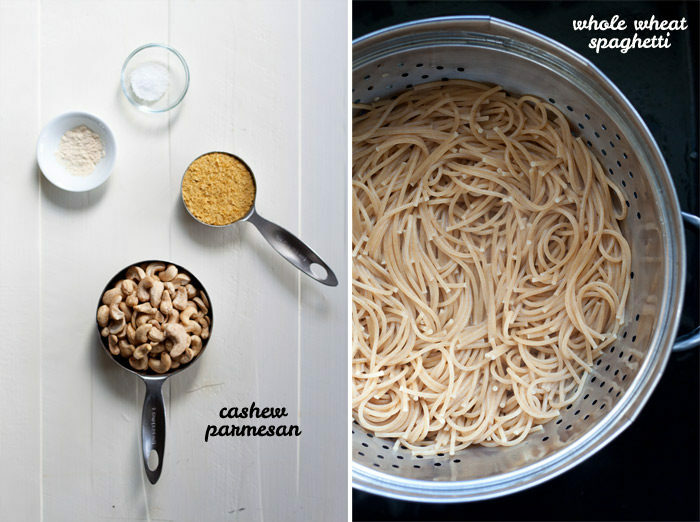 Make the cashew parmesan. Add all ingredients to a blender or food processor and pulse just until a fine meal forms. It should resemble fine bread crumbs. Set aside. Cook the pasta. Bring a large pot of salted water to a boil. Cook pasta according to instructions. Before draining, reserve about 1/2 cup of the cooking water. Drain. Assemble the Cacio e Pepe. Pour the pasta into to a large bowl. Drizzle with olive oil. Top with 1/2 cup cashew parmesan, 1/2 teaspoon pepper, and 1/4 teaspoon salt. Using tongs or two wooden spoons, toss to evenly coat pasta. Add pasta water, a couple of tablespoons at a time, and toss again, until the pasta is moistened and a bit saucy. 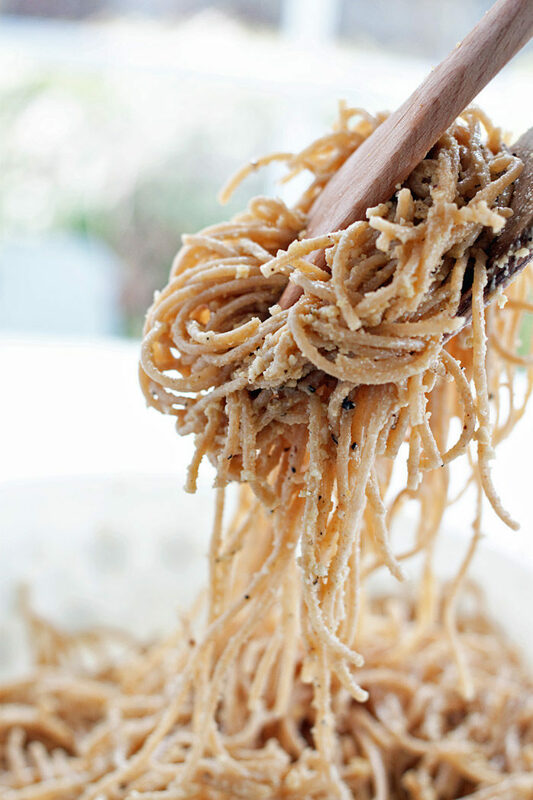 A true sauce doesn’t form as it does with an authentic Cacio e Pepe – it will be a bit more dry (but still delicious!) Taste and add additional salt and pepper if desired. Sprinkle remaining cashew parmesan over the top and give it an extra turn or two of cracked pepper for good measure. Serve. Use gluten-free brown rice pasta. I wanted to make this using leftover ingredients but ensuring that I’d come out with something still tasty. I used vegan mozzarella at home which I had lying around instead of parmesan. Also used non-dairy butter, loads of lemon zest and black pepper – really tasty. Thanks for sharing.